WhatsApp recently released a feature which enables you to delete messages for everyone in a conversation within 7 minutes. It does come in handy when you are recalling wrongly sent texts but it has been discovered that recalled texts don’t completely disappear from the receiver’s mobile phone. First spotted by a Spanish publication Android Jefe, this individual bug has been related to the notifications we see on receiving a new WhatsApp message in Android smartphones. It has been found that the deleted message’s notification still exists on the device even after the message is recalled by the sender. This is because the sent messages are stored in the notification log of the Android system. 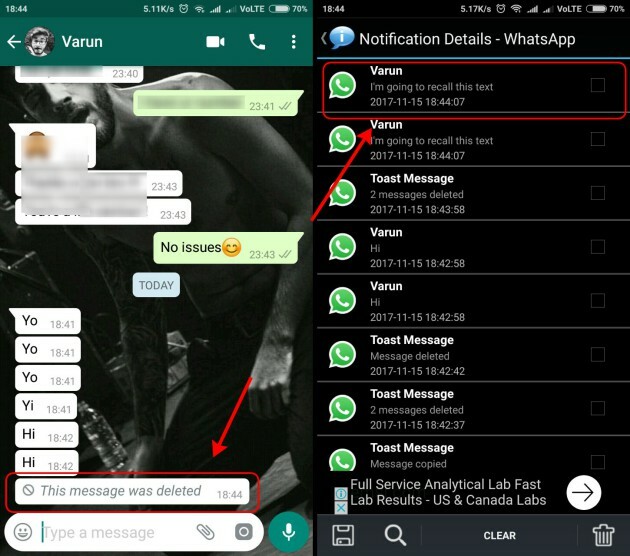 You can see in the screenshots attached above that the message has been deleted from within WhatsApp, but it still does appear in the notification log on the right. This means every time you receive a message, whose notification is shown, a copy of the same gets stored in the notification log. This log records everything in an Android session, until the device is restarted. You can access the notification log via two methods. If you have stock Android running on your device, you can easily create a notification log shortcut on your homescreen. You can even install a third party app, such as Notification History, which lets you view your device’s notification log. This is a huge security loophole in the implementation of the recall feature and the deleted texts can easily be read by someone, who has access to your Android device. They can be read by hackers as well, if your device’s security has been compromised by some intrusive malware. The WhatsApp notifications even store sensitive information and it’s a huge lapse in security, which may not be fixable because WhatsApp doesn’t recall notifications. What do you think of this security loophole? Let us know in the comments down below.